The Centre for Excellence in Islamic Finance (IBA-CEIF) in collaboration with Dubai Islamic Bank Pakistan Limited (DIBPL) is pleased to announce a 6-month certificate course for in-depth study of AAOIFI Shariah Standards. The course is designed for industry professionals/academicians under the supervision of renowned industry experts and Shariah scholars. 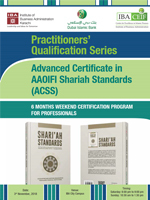 This unique course is designed to provide extensive knowledge to Industry human resource regarding essential Shariah Standards/Principles in different Islamic modes and financing facilities with their practical applicability, issues faced in practical execution and continuous monitoring of every individual transaction. This course will provide practitioners with an excellent opportunity to enhance their skills for the development of the industry as a whole.